I am planting a tree in my yard. I’ve got instructions to help insure the tree thrives. Dig a hole twice as wide as the root ball. Don’t place the tree too deep into the ground. Loosen or cut any roots that may choke out the root ball. Enrich the soil. Water every day for two weeks and every other day for two months. If I can follow these instructions, my tree will thrive for many years to come. Cancer’s innate instincts are just like these instructions: If I take care to create the proper environment and commit to giving the proper nourishment, my roots will be strong and my tree will thrive. The Cancer season invites us to bring the expansive energy of Spring back into our roots. This isn’t the same as the Scorpio season when the cold drives us to the roots. During Summer we have the bounty of our full gardens to nourish the roots of home and family and everything that feels foundational to our lives. These are the roots of our being and our cultures. These roots need attention. If they are well planted and nourished, the strong base they provide will help us thrive into the rest of the year and the rest of our lives. As the new lunar cycle of Cancer begins, it is time to attend to our roots. This tree planting is an excellent practice for this impetuous Aries astrologer. I often do not take the time to establish a good foundation before I initiate a project. (project can be anything, a relationship, a purchase, a tree). As an Aries, I spend a lot of time going back and bolstering the foundation that I could have established at the beginning. All signs have their genius. Aries and springtime gets things started in spite of prevailing conditions. Cancer season is often a time for going back and making corrections. The water nature of Cancer helps us travel into the past and perhaps gives us the necessary flexibility to make adjustments to our foundations. Water is tricky, however, it can also wipe them out. I like to think that sometimes, water gives us a new slate because we need it. Other times I think water is warning us to pay attention to what we are doing. Another Cancer quality, vigilance, can be an asset or a demon for this sign. What can possibly go wrong? Am I considering all the options? What do I need for safety now? In spite of demons, water has many, many healing gifts. Water helps us to be fluid, to let go of control. Water nourishes and cleanses. Water can be a torrent, but it can also be a pool for reflection and a quencher of thirst. It softens us and creates universal connections. This month is an excellent time to listen to and cultivate relationship with water. Our roots will benefit. 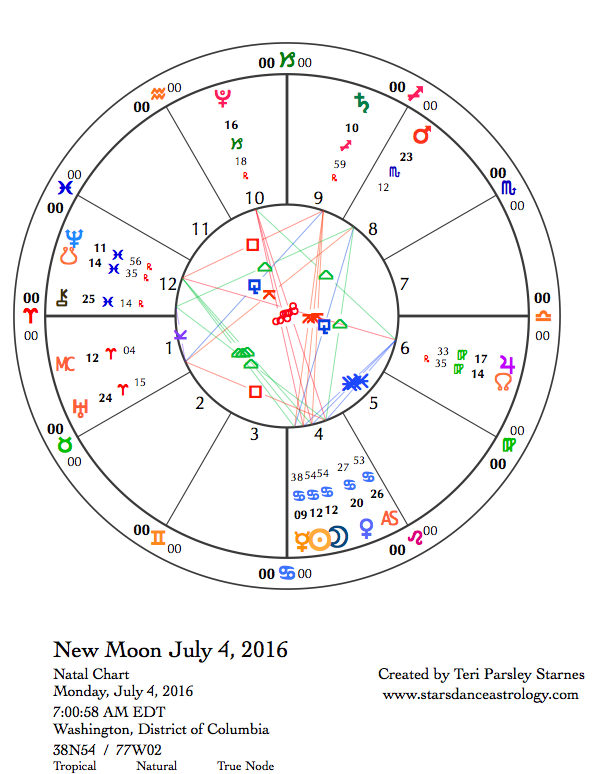 July 4—New Moon: Dreaming. The Sun has been in Cancer since the Summer Solstice on June 20, but now with the Moon catching up to the Sun in Cancer, we truly settle into the Summer season. Spring’s expansive growth calms into Summer’s focus on tending to our roots—our families, homes, and places of support. Cancer’s focus on foundation and family is mirrored by Capricorn, the sign on the opposite side of the year. We will visit this opposition at the Full Moon on July 19. Both of these signs focus on firm foundations. Both are concerned with longevity. As a cardinal sign, Cancer is a leader, which means this sign will take initiative to provide what is necessary for the wellbeing of foundational systems. This is why Cancer concerns itself with family and home. But Cancer also concerns itself with the influences of the past—the emotional impact of our origins. Cancer is a water sign. Water is an ally for sensing, beyond the intellect, what is needed, what will nourish, what feels stable. This lunar cycle will encourage us to develop the skills of fluidity. Under Cancer’s influence, this means emotional fluidity. When the planets move into Leo (fixed fire) later in the cycle, the fluidity becomes energetic. Planets in harmonious trine allow flow to happen. The squares and oppositions that come during this month offer an opportunity to tap into the skill of flow in order to break free of stagnation. At times, going with the flow means steering yourself out of danger. Self-love is an essential ingredient to add to Cancer’s concern for others. The gift of nourishment becomes all the more powerful when we nourish ourselves. 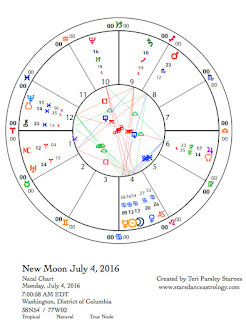 The chart for the New Moon has a little of everything we will be experiencing this month. There is plenty of flow and harmony in the water signs between Venus in Cancer, Mars in Scorpio, and Chiron in Pisces, creating a grand water trine aspect pattern. The Moon and Sun trine Neptune in Pisces as well. Hints of conflict come from the opposition between the Sun and Moon and Pluto in Capricorn. We are aware that oppressive forces may threaten our safety. 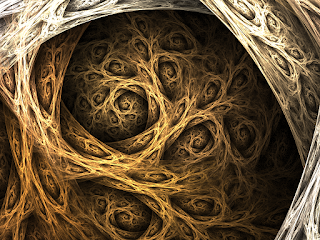 The quincunx between Uranus in Aries and Mars is an agitation that creates dissatisfaction with the status quo. The square between Saturn in Sagittarius and Neptune is a reminder that on the political front we are in the process of choosing which reality to believe in. Forces of illusion are great. At times we can feel the despair. Mercury in Cancer is quincunx Saturn exactly today emphasizing the challenge and necessity for focusing paradoxical attention upon emotion and reason. The effort creates stress and holds a lot of potential for growth. Jupiter in Virgo continues to give the message that a pragmatic response is the best for creating the stories that heal. Tuesday, July 5. A dreamy start to the day sets the stage for Leo fun and creativity. Early on, while the Moon is still in Cancer, Mercury in Cancer makes a trine aspect to Neptune in Pisces. This is an excellent signature for dream work, artistic inspiration, and intuitive insight. As we begin to dream upon our water intentions for this lunar cycle, take this inspiration into your intentions. Water is essential for life. How we treat water has direct affect on whether we thrive or merely survive, or worse. What if we turn our creative efforts this month to living in right relationship with water? Let the Moon in creative Leo today help you begin your intentions with joy and passion. Wednesday, July 6. Stay tuned for an important transmission from the celestial news network. Mercury and the Sun conjoin on the opposite side of the Sun from Earth’s perspective. The Messenger god is collecting information to be broadcast when this planet emerges from the Sun’s glare sometime around July 20. An important influence on this message is the opposition that the Sun and Mercury receive from Pluto in Capricorn. Tomorrow these oppositions are exact. Sometimes power hides in the shadows, sometimes it comes out into the light of day. Some of this power is toxic and some is life giving. Over the next few weeks, we will be choosing the expression of power that feels right to us, and perhaps fighting the power that doesn’t. The heart of Cancer can guide us in making these important choices. Water whispers wisdom. This is not the only important aspect influencing this day and the rest of the lunar cycle. Venus in Cancer forms a trine to Mars in Scorpio, which has recently turned direct and is still very stationary. Mars in Scorpio is an ally for choosing the power that heals if we are willing to accept everything hidden in our shadows. Venus says radical love is a way to the power that transforms. July 7—Crescent Moon: Beginning. “Tend to the roots; follow water’s wisdom” is my intention for this Cancer-seeded lunar cycle. I want to investigate my relationship to water. I am sure there are ways I can be more respectful of this precious resource and find more delight in water’s magical qualities. Activism around water is a part of this sacred relationship. Today’s aspects are edgy. Mercury and Sun in Cancer are opposing Pluto in Capricorn. Venus in Cancer is square to Uranus in Aries. The Moon in Leo is square to Mars in Scorpio. We may notice injustices, the abuse of power, and the agitating influence of those who are unhappy with the status quo or feel they must protect their own interests. Vigilance is one extreme expression of Cancer’s desire to protect and nurture. Some of us may decide to add our voices and efforts to change the world. I’d like to invite you to consider turning your desires for justice and change towards the issues surrounding water. For example, here is one tribe in North Dakota who are resisting an oil pipeline slated to cross the source of their drinking water, the Missouri River. http://www.honorearth.org/supportingsacredstonespiritcamp. At this time of beginning, let us be more informed and ready for action. The Crescent phase of the Moon encourages our beginnings. We are moved to break away from the limitations of the past and envision new possibilities. Don’t be discouraged by the Moon’s ingress into Virgo to feel overwhelmed by the enormity of your vision. Let Virgo’s genius contribute the pragmatic small steps that lead to everlasting change. Friday, July 8. Heart openings may set free a flood of emotion. Venus in Cancer trines Chiron in Pisces, and Mars in Scorpio is within two degrees of trining both as well. A grand water trine aspect pattern has planets in all the water signs forming harmonious but not altogether unchallenging connections. When water is allowed to flow after being withheld for a time, it can feel overwhelmingly vulnerable. What do we do with the grief, the empathy, the flood? The Moon in Virgo may try to tamp down on emotion with brusque efficiency. Rather than letting that happen, invite the Moon to give you a lifeline to the shore and allow yourself to feel all the feelings today. My favorite Virgo lifeline is the idea that small steps can be more powerful than large ones. We don’t have to take center stage to give our support to the movement. The Moon is contacting Saturn in Sagittarius and Neptune in Pisces, adding to this need to find an anchor in the shifting realities of our world. Mercury in Cancer makes a delightful sextile to Jupiter in Virgo, take comfort in your foundation. Be blessed by the supports in your life. Saturday, July 9. The glyph for a sextile (an aspect of 60 degrees between planets) looks like a star. Just like stars in the sky, these aspect stars incite delight. There are lots of sextiles today between Virgo influences and Cancer influences. Although exact tomorrow, the sextile between the Sun in Cancer and Jupiter in Virgo incites domestic delight. That may not sound exciting to you, but it can be. You may be surprised by a desire to nest a little today. Have you ever noticed how you can change the energy in the room by sweeping it? Such a simple and effective magic trick can bring relief. Find more today when these two signs get in gear with each other. The Moon in Virgo repeats the refrain with a conjunction to Jupiter and a sextile to Mercury and Venus in Cancer. The Moon also forms a sextile to Mars in Scorpio, allowing the good side of Mars to shine forth. Perhaps you will use this energy to clean out a closet and donate the items to a thrift store. Sunday, July 10. Harmony continues through planetary aspects today. That doesn’t mean we don’t feel the ongoing struggles of life, but perhaps it is a bit easier to find the help or insight we need to meet them. Mercury in Cancer forms a trine to Mars in Scorpio. Talk about your feelings. Listen to what others are telling you about theirs. It’s OK. We have extra resiliency to connect with each other in a meaningful way. Thank water’s wisdom for that.